NICE has issued Technology Appraisal Guidance (TAG) for olaparib (Lynparza), recommending it as a cost effective option for women with platinum-sensitive relapsed (PSR) BRCA-mutated (BRCAm) high-grade serous ovarian cancer who have had three or more courses of platinum-based chemotherapy. Clinical commissioning groups, NHS England and local authorities are required to comply with this recommendation and ensure that olaparib treatment is funded and accessible within 90 days. 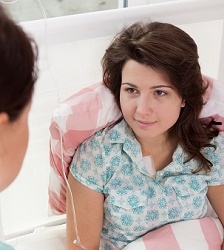 NICE has recommended use of olaparib in patients who have completed three or more courses of platinum based chemotherapy and who meet the European license criteria. Olaparib is the first targeted therapy for women with BRCAm ovarian cancer and clinical trials show that it provides an important quality of life benefit by significantly increasing the time it takes for the disease to progress and the time to further chemotherapy cycles. There was an 82% risk reduction in time to progression versus standard ‘watch and wait’, which is the largest ever effect for this outcome in women with ovarian cancer (HR 0.18, p<0.0001; median progression free survival, 11.2 months versus 4.3 months). These data are for the overall population that olaparib is licensed for; data for the NICE-approved patient group are consistent with this. Ovarian cancer is a serious and life-threatening condition that causes more than 4,000 women in the UK to die each year. The UK’s survival rate for ovarian cancer lags behind other major European countries with England having the lowest five year survival rate in Europe. Up to 21% of women with the most aggressive form of ovarian cancer have the genetic BRCA mutation and it is this patient group for whom olaparib is licensed in Europe. The only other treatment options are chemotherapy or surgery. Olaparib, which is taken in a tablet form, is the first and only targeted therapy for ovarian cancer and offers a new approach to the way the disease is treated. It works by blocking one of the cancer cell’s repair pathways, and in patients who also have the BRCA mutation, this results in the cancer cell dying. The European Commission approved olaparib on 16 December 2014 for platinum-sensitive relapsed (PSR) BRCA mutated (BRCAm) ovarian cancer (including fallopian tube or primary peritoneal) who are in response (complete response or partial response) to platinum-based chemotherapy. To date, the most common side-effects experienced by patients taking olaparib were mild to moderate, did not cause the patient to stop taking treatment, and included nausea, fatigue, vomiting and anaemia. For women with a BRCA gene mutation, their risk of ovarian cancer is as high as 40-60%, compared to a 2% risk in the general female population. There are approximately 1,100 women per year in England and Wales who are diagnosed with BRCAm ovarian cancer, including around 450 women who have had three or more courses of platinum-based chemotherapy who could be eligible for treatment with olaparib through the NHS. Now available: an exclusive GM special report on the latest developments in ovarian cancer. Download your free copy today.